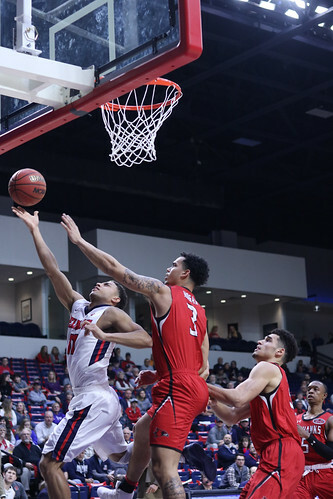 The Belmont men’s basketball team dominated Southeast Missouri State 97-71 Thursday night. Senior Kevin McClain and freshman Nick Muszynski both scored career highs in the Bruins’ massive victory. McClain scored 31 and Muszynski scored 27. The Bruins started off strong and never looked back. Though the Redhawks shot well at the 3-point line, hitting 6-10 in the first 16 minutes of the game, they were unable to stop Belmont’s electric offense. Belmont went into halftime with a confident 47-29 lead. Senior Dylan Windler had another explosive night, getting a double-double only 18 minutes into the game. He ended the game with 23 points and 16 rebounds. The Bruins improved to 7-2 in the conference record and will face UT Martin on Saturday at 7 p.m. at the Curb Event Center. Photos by Carina Eudy and Melissa Kriz.